What Are the Symptoms of an IT Band Injury? When Should I Call the Doctor for Iliotibial Band Syndrome? Are There Home Remedies or Exercises for ITBS? How Do You Stretch Your Hip for IT Band Pain? What Are Medications and Treatment Options for IT Band Syndrome? What Is the Follow-up for Iliotibial Band Syndrome? How Can I Prevent Iliotibial Band Syndrome? The iliotibial band (IT band) is a thick band of fibers that begins at the iliac crest (the border of the most prominent bone of the pelvis) in the pelvis and runs on the lateral or outside part of the thigh until it attaches into the tibia (shinbone). The gluteal or buttock muscle fibers and the tensor fascia latae (muscles of the hip joint) attach to it, and the band acts to coordinate muscle function and stabilize the knee during running. 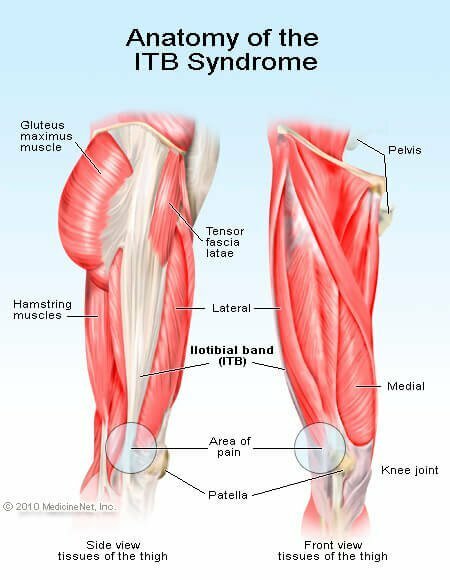 Iliotibial band syndrome describes the pain caused by inflammation of the band as it crosses the lateral femoral epicondyle. When the leg is in a straight (known as extended) position, the band fibers are anterior to, or in front of, the condyle (a bony projection on the outer surface of the femur, or thigh bone). As the knee flexes, the fibers move across the lateral femoral epicondyle and are positioned behind or posterior to it. A bursa or sac in this area allows the IT band to glide over the end of the femur. When the band becomes irritated, friction may occur with walking or running, causing lateral knee pain due to inflammation on the side of the knee joint. If symptoms are ignored, further inflammation and scarring may occur in the bursa, causing progressive knee pain with decreased activity. Inflammation of the IT band occurs because of overuse and is most often seen in marathon or other long-distance runners. Commonly, mechanical issues with poor flexibility and decreased strength in the quadriceps muscles of the thigh lead to the inflammation. Factors such as leg length discrepancy, an abnormal pelvic tilt, and "bowlegs" (genu varum: genu=knee + varum=angles in) may cause iliotibial band syndrome because of excess stretching of the IT band across the femoral condyle. Training errors in long-distance runners (for example, running on one side of the road only) may also cause symptoms. Since most roads are higher in the center and slope toward the edge, running on only one side will cause one leg to always be downhill from the other. Runners who fail to recognize this issue are at risk to develop inflammation of the iliotibial band. Because of the mechanics of running, in contrast to long-distance runners, sprinters tend not to develop this syndrome, but tennis players and bicyclists may. Lateral knee pain is the primary symptom due to inflammation as the IT band slides across the femoral epicondyle on the outside of the knee. Pain is most severe with the heel strike of walking or running and may radiate from the knee up the leg to the hip, causing hip pain. Pain may also be felt with knee flexing, especially going up or down steps. Physical examination may reveal general tenderness over the site of the iliotibial band insertion at the knee joint, and specific tender points may be felt over the lateral femoral condyle where the bursa is located. The examination may find some weakness or imbalance of the quadriceps muscles (those in front of the thigh that extend the knee) and the hamstring muscles located in the back of the thigh that flex the knee. The iliotibial band may also be tight. Its flexibility can be determined by the health care provider as the patient is taken through a variety of stretches. The Thomas test and the Ober test are the names of two maneuvers that may be helpful in assessing the flexibility of the tensor fascia latae, the gluteal muscles, and the iliotibial band. Pain should be a signal to a runner that a problem exists and often signals an overuse situation. Rest, ice, and appropriate use of over-the-counter antiinflammatory medications (ibuprofen [Advil, Advil Childrens, and others]) may be adequate therapy to return the patient to their previous activity level. The pain should also be a signal that perhaps a biomechanical problem exists that may lead to future injuries. If this conservative home treatment fails to completely resolve IT band symptoms, if the symptoms worsen, or if the symptoms occur with decreasing amounts of activity, it may be time to be seen by a health care provider for further evaluation and treatment. Initial treatment for most overuse injuries remains the same: rest, ice, elevation and antiinflammatory medications. Most often, the symptoms occur with an aggressive activity like running; cross-training alternatives like bicycling or swimming may be attempted while the iliotibial band inflammation resolves. A. Hands are held on the waist, and the injured leg is crossed behind the good leg. B. 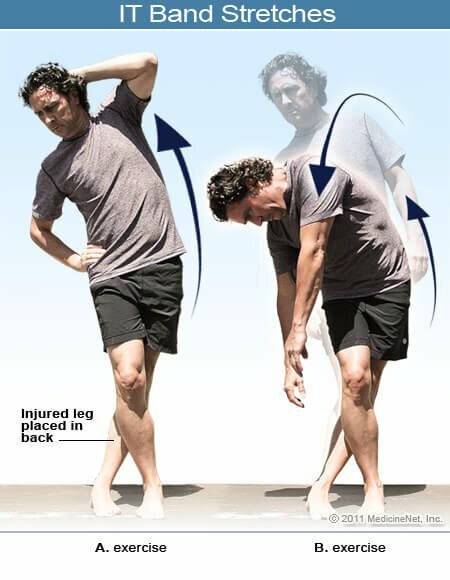 The arm on the same side as the injured leg sweeps up and over as the hips are moved laterally toward the good side, allowing a lateral bend at the waist. There should be no twisting with this stretch and no need to touch the foot of the injured leg. Aside from pain control with anti-inflammatory medications, treatment alternatives tend to be recommended in a stepwise approach. Physical therapy may be a viable treatment option for many patients with iliotibial band syndrome. The therapist may wish to assess running technique and style to look for an underlying biomechanical cause of iliotibial band inflammation. This may include gait analysis as well as flexibility and muscle strength assessment. The therapist may be able to recommend proper shoes or an orthotic shoe insert to help correct any imbalances or abnormalities. The therapist may teach specific stretches to loosen tight structures. In treating the acute injury, phonopheresis (a technique in which ultrasound is used to propel anti-inflammatory or corticosteroid medications through the skin into the inflamed tissue) or iontopheresis (an electric charge is used instead of ultrasound to deliver the medications through the skin) may be considered. If rest, ice, and physical therapy fail to resolve the ITBS inflammation, the health care provider may consider a corticosteroid injection into the inflamed area. Finally, if all else fails, surgical options do exist for ITBS. An orthopedic surgeon, using an arthroscope, may be able to break down the scarring surrounding the iliotibial band. If needed, the band can also be lengthened to decrease the stretch and subsequent potential for irritation and inflammation as it crosses the femoral condyle. As with any overuse injury, once the first episode is resolved, it is important for the patient to assess why the iliotibial band became inflamed in the first place. Recommendations from the physical therapist regarding training techniques, footwear options, the need for orthotics, and proper stretching will be helpful in preventing the recurrence of symptoms. Ideally, the goal for the patient will be to return to the level of activity enjoyed prior to the injury. The most common cause of iliotibial band syndrome is running. Prevention opportunities include the use of proper footwear, adequate stretching after running, and being aware of training mistakes, especially running the same direction on a track or on the same side of the road. Knee pain is one of the most common musculoskeletal complaint that brings people to their doctor. With today's increasingly active society, the number of knee problems is increasing. Knee pain has a wide variety of causes and treatments. Please share your experience with IT band syndrome. What symptoms did you have with IT band syndrome? What exercises and/or stretches helped your IT band pain? Do you use a foam roller for your IT band injury?